Devanet® have continually invested in automation to improve quality and productivity where finances and space permit. Small footprints and machines that can deskill about intensive operations are key to remaining competitive at the same time assuring customers that projects can be completed within reasonable time frames compared to offshore suppliers. The latest innovation is the automatic computer controlled, edge stitching machine, sophisticated, auto sensing and dedicated to producing optimal results 10 times faster than manual intervention, this is a state of the art sewing machine that enhances the ability of the company to deliver top quality, consistent and faster output than any other sewing capability. With output rates up to 140 belts an hour, there is very little to compete with such a machine. Variable stitch lengths, automatic sensing of different end tips, width and length, auto back tacking and trimming and most importantly the ability to offer customers real performance with less rejects and a beautiful finish. 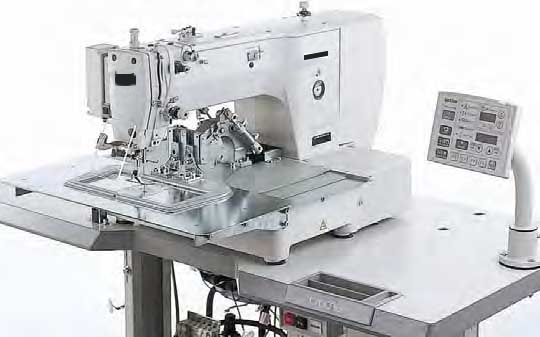 devanét have also computerised pattern stitching machinery to provide a top quality pattern stitching service for belts and leather gifts. The machine is capable of stitching complex designs in a field area of 220 x 100 mm automatically and with consistency in quality and performance across a wide range of products. Special programming software and laser designed jigs made by our associate company diamond engravers means that designs and development for customers is controlled inhouse. The services will enhance the existing facilities which have been extended to offer leather slitting, die cutting and our heavy duty stitcher's for webbing and leather. The most valuable asset for our customers is that what would normally be a complex job can be achieved speedily and with consistency, so that quality control is easier to maintain than by using hand eye co-ordination. The computer stitching is capable is of using a variety of thread thicknesses to simulate various effects and designs can be enhanced by including patterns which would be virtually impossible by hand or standard flatbeds. Each pattern for a given design is programmed in house and any holding jigs required are made on our own CNC or laser machines, this saving considerable expense to customers. Each job is costed on a setup and time profile and it is important that we produce a prototype before full production. Once the stitch pattern and design are approved, the design is saved and coded for future use, so the customer can have the design replicated whenever they need a repeat order. For the benefit of customers, a typical stitch pattern made by hand on a flatbed say taking 5 minutes will take less than a minute on our programmable machines. If a customer had to buy jigs the cost would be several hundred pounds for each design so there are significant advantages letting Devanet undertake your stitch designs.